Design a navigational user interface (UI) for vessels, which builds up a point cloud based 3D world of the ship’s surroundings. The UI should be an easy-to-use interface that allows users to view and highlight points of interest, including dynamic and static objects, distances, danger zones, etc! We dug deep for meaningful experiences and emotions that we wanted our users to experience when using or interacting with our concepts and ended up with two abstract experience goals (XGoals): Self-worth and Unity. These terms represent the feelings of “I matter” and “We matter”, respectively. In essence, the XGoals are answers that we want our concepts to convey to a user that might be worried about their place at the ship, both personally and socially, when automated technologies are becoming more and more prominent. In order to make our XGoals more tangible, we divided each of the XGoals into sub-XGoals, where accomplishing the sub-XGoals should lead into the user experiencing the main XGoals. Our applicable concept is a navigational tool that combines various systems currently used on ship bridges. The aim is to reduce the clutter and amount of separate devices in the work environment of the officers. 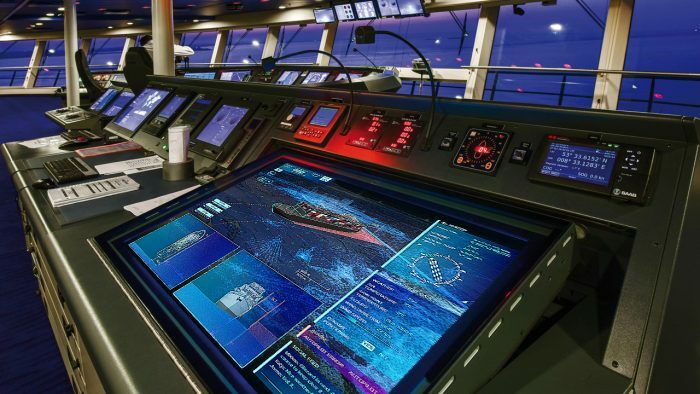 Our concept combines ECDIS electronic maps, Automatic Identification System information, traditional radar technology and LiDAR laser sensor data into one touch screen display. We promote the user’s professionalism by giving them control over the information they want to see and use in their daily work. They are experts at their jobs and the system should be a streamlined tool for them — they should have a sense of control. The crowdsourced information map builds a sense of global community and shared professionalism, while the ship’s internal social feed enhances the interaction among the crew. To better evaluate the usability of this concept, we built a functioning iPad prototype which included some of the key features and functionalities of the end product, gave an introduction of it to the testers and allowed them to explore the tool themselves. For our radical concept we decided to explore the relationship between the crew members and the ship. Rolls-Royce has invested a lot of resources into ideating the ship of the future and how they could be automated. So we decided to explore the “not so distant future”, where there are still crew members on board, but in fewer numbers due to emerging automation technologies and sensors replacing some of the routine duties of the ship. The concept is centered around an artificial intelligence (AI) system that has access to all the sensors and information technologies of the ship, but cannot control any of the operative systems on the ship (such as steering, route planning, cargo loading/unloading etc). This allows the AI to synthesize various sources of information and make plans, schedules and suggestions for the crew that they can utilize in their workflow, but not without the crew’s explicit approval.